Lining up for a treat at Mardi Gras Snowballs. Tallahassee’s dining scene is known for farm-fresh produce and time-honored spots where power brokers dine. 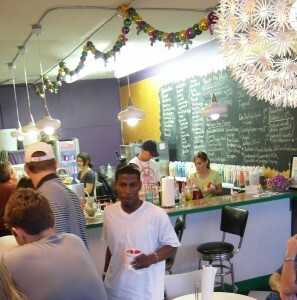 But it’s also one of the only places outside of the Big Easy where you can enjoy an authentic New Orleans snowball. Take what you know about snow cones and toss it out: A snowball is a super-fine shaved ice treat topped with rich syrups and sometimes stuffed with soft-serve ice cream. It can even be topped with condensed milk or ordered in sugar-free flavors. Big Easy Snowballs offers flavors as varied as strawberry cheesecake, tiger blood and margarita, along with New Orleans favorites nectar cream and wedding cake. With so many choices, you’ll be glad that free samples are encouraged. The owners of this midtown shop bought their equipment (and still order their syrups) straight from New Orleans, so you know you’re getting the real thing.